SUREPRESS L-4033A - Efficient & Profitable! The Epson SurePress L-4033A Digital Inkjet Label Press makes short run printing much easier, faster and more efficient, giving your business higher productivity and profitability. The Epson SurePress L-4033A Digital Inkjet Label Press makes short run printing much easier, faster and more efficient, giving you higher productivity and profitability. Not only will it streamline your current workflow, it will add to your bottom line by allowing you to accept additional short run jobs. With the Epson SurePress L-4033A, you’re ready to handle all the short-run printing your customers need for sales promotions. Epson developed a new water-based pigment ink set customised for the SurePress L-4033A with six colours including Green and Orange for an extra-wide colour gamut. 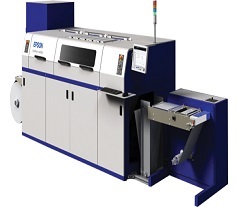 It ensures accurate colour reproduction for precise colour matching, and provides excellent adhesion on a wide variety of standard label stock substrates without the need for any pre-treatment.